If you have not read the article “The Breaking of Ouroborus” by Cyprium, i recommend beginning there before reading this, as much of what is written in this article will make better sense read second to that one. 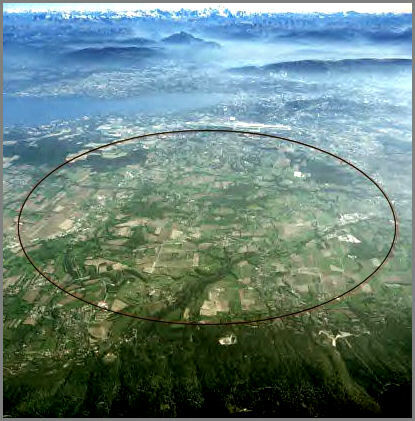 The CERN LHC (large hadron collider) is a massive particle accelerator near Geneva Switzerland, costing 9 billion dollars to build. The goals of this machine are claimed to be aimed at understanding the answers to the fundamental questions of physics, including the hope of discovering the hypothetical Higgs boson. In theory, the Higgs boson, often called the “god particle”, is a massive scalar elementary particle which gives all things mass. This particle would supposedly be the framework of all things existing in physicality. The LHC intends to collide particles at a rate slightly under the speed of light and in the process will be potentially creating black holes, exotic matter and wormholes. The worried public has been reassured that nothing disastrous can occur from the experiments which they intend to do at CERN. It is assured, they say, that such things as black holes and wormholes would remain so incredibly small and exist for such a tiny fraction of time that they would be harmless and merely side effects of their intended goals. So far, though the LHC has encountered many and strange interruptions which has prevented it from reaching it’s full potential yet, it has already produced black holes. 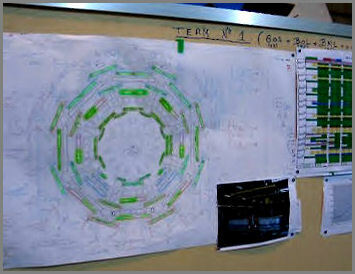 CERN’s large hadron collider is expected to produce wormholes as well. Wormholes are a means by which traveling through time is possible, though for one to be traversable it must be much larger than the subatomic size which CERN claims will be the only ones possible with their particle collider. The function of a wormhole can basically be understood by the analogy of piercing two ends of a piece of paper with a needle and then folding that paper so that those two holes connect. The necessity to travel across the paper’s surface is bypassed, the paper itself representing time and space. Two physicists, Irina Ya. 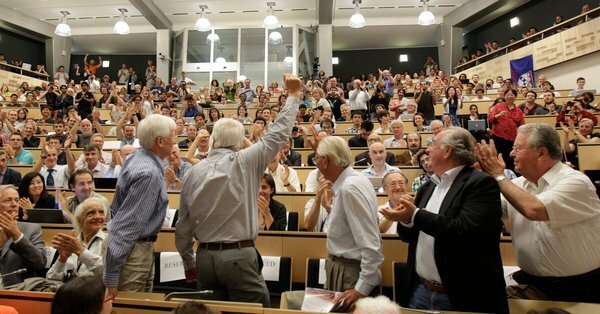 Aref’eva, and Igor V. Volovich disagree with CERN’s assurances that traversable wormholes are not the direction CERN is headed toward. The LHC is now operating at 7 TeV (teraelecrtronvolts, 1TeV=i trillion electronvolts) with a stated goal of eventually reaching 14 TeV. It is argued that traversable wormholes could not be created on earth since the energy required would be something comparable to stellar explosions, though the amount of kinetic energy necessary to produce results of a certain kind within a collider are less than that required to produce the same results in space. The formation of exotic matter would be necessary to the formation of a traversable wormhole as a result of the Casimir effect which is a sort of localized vacuum phenomena in which a mass negative region of space-time can exist. Exotic matter violates energy conditions, having negative mass or repulsion to gravity. At high enough energy of collision exotic particles can be formed and have been detected at the LHC. Time in no straight line, it is a circuit and circuits repeat themselves. Why this should be is not questioned as much as whether it is but the fact that time is a circuit is observable with no doubt. It can be observed as simply as watching the eastern Horizon at sunrise on the morning of the Spring Equinox. As time passes, the sun rises through the houses of the zodiac in a circular pattern which eventually arrives back at it’s beginning point. Why time exists in a cycling pattern is directly connected with the origin of sin and that there are beings, including Satan who are interested in maintaining a timepath which never exits into eternity and so to the judgment and defeat which is determined to them. As these days give every sign of being the last days, Satan knows his time is short in a literal way. Knowing he will not be successful against the Most High, he knows that his chances only rest in a device to maintain or begin anew the next cycle. 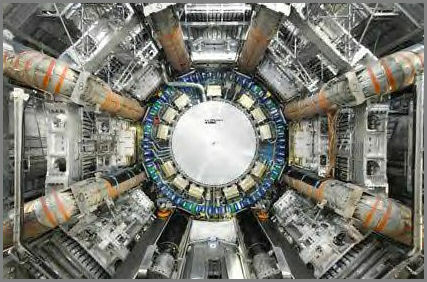 It would seem that this is what CERN”S Large Hadron Collider has been built to achieve. It is evident not only in the published science involved but the geometric design of the machine. 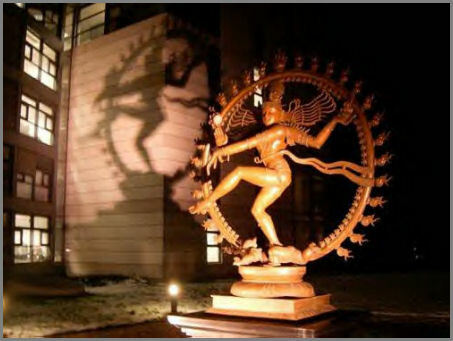 CERN represents it’s goals with a statue of Shiva. Shiva is a deity who represents death and rebirth, a being connected with the idea of a circuit of time which folds in on itself to meet end to beginning. 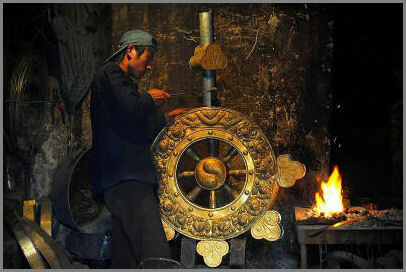 In Buddhism a symbolic object exists called a dharma wheel. 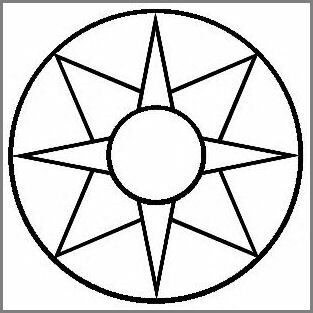 It is an 8 spoked wheel that represents the noble 8-fold path to enlightenment. It is described as a way which leads to the ceasing of suffering and the achieving of a new and more enlightened consciousness which perhaps can be said to sound quite a bit like the promise of world peace in a “new world order”. 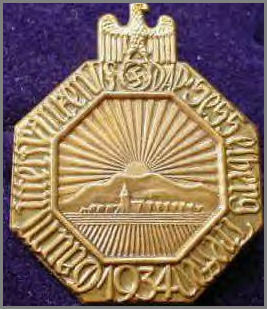 The symbolism of 8 and what its meaning is connected to a circle of time is found in an ancient inscription in Egypt. 8 is a number which universally symbolizes the new beginning following the close of a repetitive time sequence. The 8th day in weeks is also the first. The design of certain components of the LHC will remind you of the symbols just spoken of. 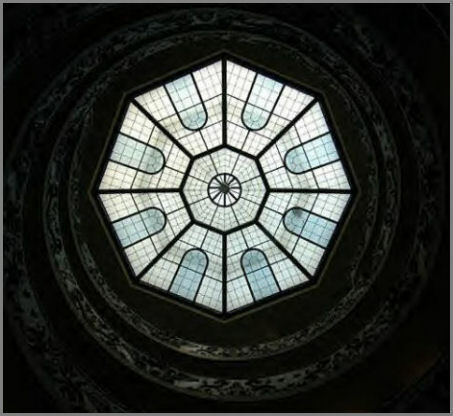 The Dharma wheel and 8 fold path is not simply a religious concept. Physics itself involves a theory called the the 8 fold way. This is a theory for organizing subatomic baryons (a composite particle made of three quarks) and mesons (made of one quark and one anti quark) into octets. Both of these particles belong to the hadron family. 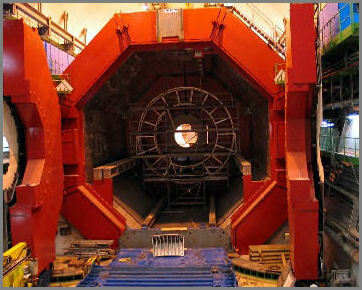 It is most interesting to notice that the LHC has repeatedly been prevented from reaching it’s intended potential by various strange circumstances which have even led some scientists to wonder if the machine was being sabotaged by itself from a future point or perhaps even time travelers who already understood the dangers of the thing. One occurrence was nothing more than a little bird who dropped a bread crumb into the machine. I believe it is neither the machine itself or time travelers but it is not coincidence either. I believe that YHWH Himself hinders their progress and it remains to be seen if there will come a point when He will allow them to attempt all that they design to do with it. The latest thing to hinder the LHC’s progress is an unknown vibration which they term “the Hump”. It is a high frequency vibration between 31 and 38 KHz and has caused beam losses for the collider while in operation. CERN is not able to identify what the vibration is or where it might be coming from except that it either originates directly below or directly above the collider ring. It is just such a vibration as to cause the perfect means for disruption of the machine. It is my conclusion that He has drawn a line which will not be crossed except by His will at His timing if ever and even should this device accomplish to create a continued time loop, He has promised that His plan for eternity will not be thwarted. They really did discover something. This entry was posted on 05/26/2010 at 1:45 AM and is filed under 12 : Technocracy with tags 8, 8 fold path, ALICE, ATLAS, black holes, Buddhism, Casimir effect, CERN, chaos star, Dharma wheel, Egypt, eight, energy, exotic matter, fallen angels, Freemasonry, God particle, hadron, Higgs Boson, Igor V. Volovich, Irina Ya. Aref'eva, large hadron collider, LHC, New World Order, NWO, octagon, ouroborus, particle collider, physics, Roslyn chapel, Satan, Shiva, TeV, the Hump, theoretical science, time, time loop, time machine, time travel, traversable wormhole, Watchers, William Sinclair, wormholes, YHWH. You can follow any responses to this entry through the RSS 2.0 feed. You can leave a response, or trackback from your own site. thanks for laying all that out. extrordinary. these are incredible times.